All wholesale power and gas contracts rose this week. Prices have been supported by the recovery of commodity prices, below seasonal normal temperatures and tighter supply margins amid nuclear outages and weaker wind generation. 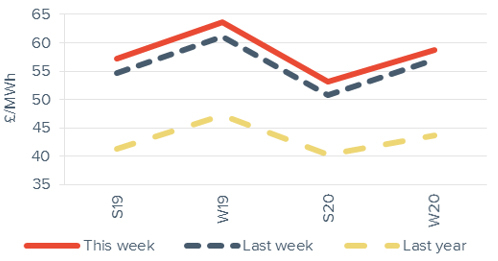 With half of UK nuclear capacity offline due to planned and unplanned outages this week, day-ahead baseload power was up 3.1% from the previous week to £64.4/MWh. 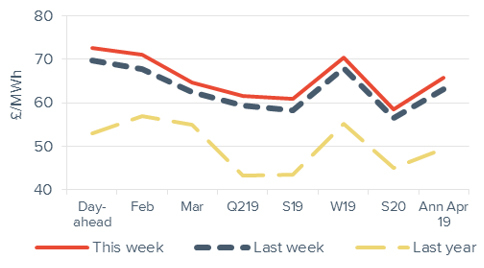 All seasonal baseload power contracts went up week-on-week, rising 3.8% on average. 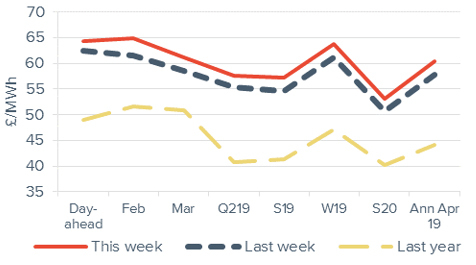 Gas contracts also rose this week, with day-ahead gas up 5.4% to 62.5p/th, as gas for heating demand went up towards the end of the week following much colder temperatures. February and March 19 gas climbed 1.6% and 1.2% to 62.9p/th and 60.7p/th respectively. 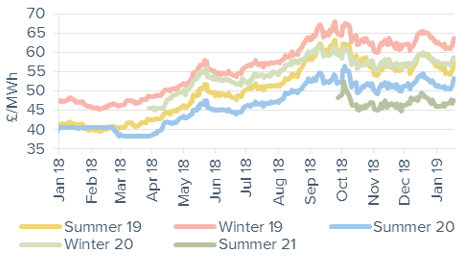 Seasonal gas contracts were up 2.7% on average, with summer 19 gas increasing 3.3% to 55.3p/th, following oil prices higher. Brent crude oil prices rose for the second consecutive week, up 1.2% to average $60.6/bl. Prices have risen as data showed OPEC’s production cuts coming into effect, despite news that US crude production hit a record 11.9mn bpd the previous week, up from 11.7mn bpd the week before. EU ETS carbon prices recovered from last week’s decline, rising 3.8% to average €23.2/t. Within-day carbon prices reached a high of €24.7/t on 18 January, the highest since 3 January. API 2 coal prices went up for the first time in three weeks, increased 2.9% to average $84.6/t. Coal prices have been supported by colder temperatures across Europe, increasing demand for coal-fired power generation. 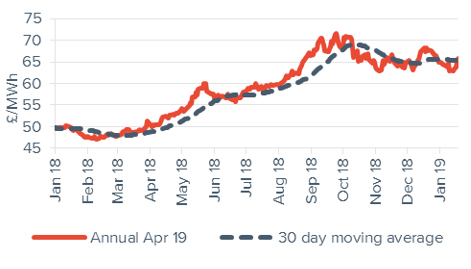 Day-ahead power rose 3.1% week-on-week to £64.4/MWh, amid tight supply margins following several nuclear outages and forecasts of lower wind generation. February and March 19 power contracts gained 5.5% and 4.3% to £64.9/MWh and £62.2/MWh respectively. Annual April 19 power gained 4.5% to £60.4/MWh. 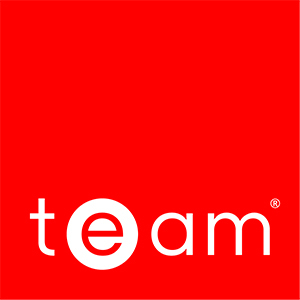 The contract is 2.9% below the same time last month when it was £62.2/MWh and 36.7% above the same time last year when it was £44.2/MWh. Day-ahead peak power rose 3.9% to £72.5/MWh. This was £8.1/MWh above its baseload counterpart. 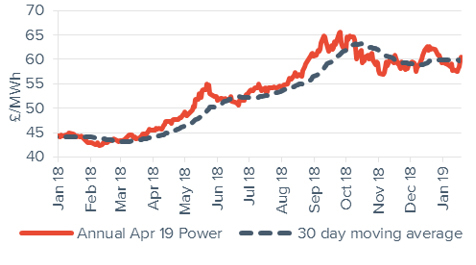 Month-ahead peak power went up 5.1% to end the week at £71.1/MWh, remaining £6.2/MWh above its baseload counterpart. Week-on-week, annual April 19 peak power rose 4.2% to £65.8/MWh. 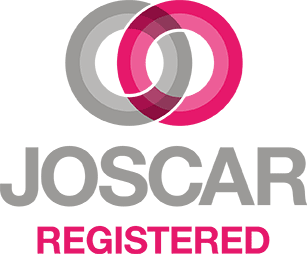 The contract was £5.4/MWh above its baseload power counterpart. 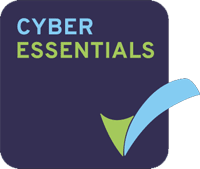 The contract was 3.0% below its price last month (£67.8/MWh) and 33.2% higher than its value last year (£49.4/MWh). All seasonal contracts rose, up 3.8% on average. Both summer 19 and summer 20 power went up 4.7% to £57.2/MWh and £53.2/MWh respectively. All seasonal peak power contracts went up this week, recovering the previous week’s decline. 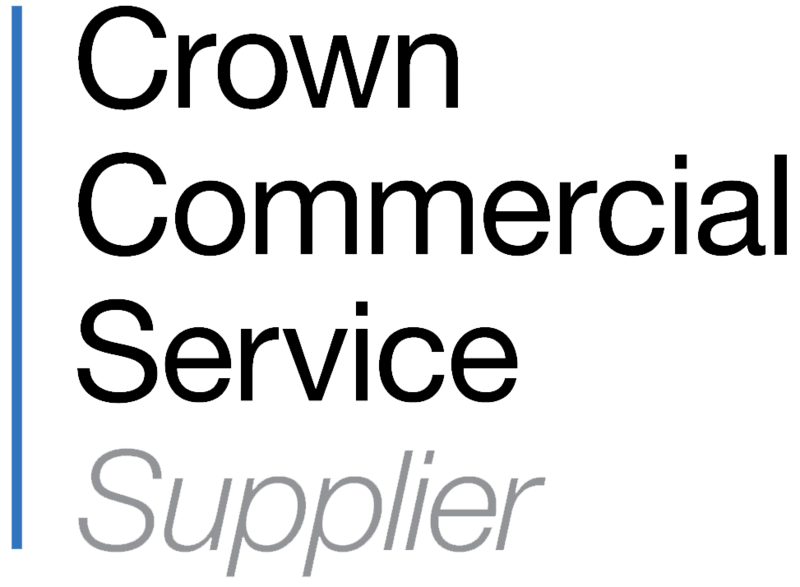 Seasonal peak contracts went up 3.5% on average. The summer 19 contract saw the largest change, gaining 4.6% to £61.0/MWh. Brent crude oil prices rose for the second consecutive week, up 1.2% to average $60.6/bl. Prices have risen as data showed OPEC’s production cuts coming into effect, despite news that US crude production hit a record 11.9mn bpd the previous week, up from 11.7mn bpd. This week, HSBC lowered its 2019 Brent crude oil price forecast by 20% to $64/bl. The bank has cited strong growth in US oil supplies and uncertainties over global oil demand amid slower than expected economic growth. 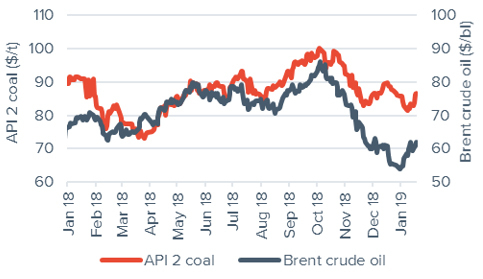 API 2 coal prices went up for the first time in three weeks, increased 2.9% to average $84.6/t. Coal prices have been supported by colder temperatures across Europe, increasing demand for coal. EU ETS carbon prices recovered from last week’s decline, rising 3.8% to average €23.2/t. Within-day carbon prices reached a high of €24.7/t on 18 January, the highest since 3 January. 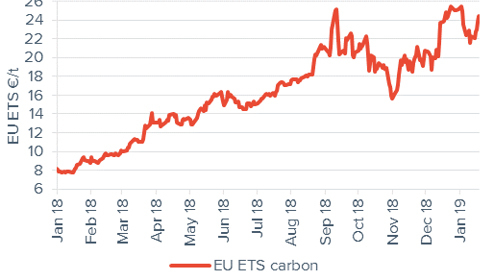 This week, a survey of analysts by Reuters revealed an increase in EU ETS carbon price forecasts, with EUAs expected to average €27.0/t in 2019 and €32.8/t in 2020, before dropping to €27.3/t in 2021. Following this week’s defeat of Brexit plans, the UK PM Theresa May will present a new/changed proposal for Brexit to Parliament on 21 January, which may bring further insight to plans for the UK’s carbon tax beyond 29 March.